This is a detail of one of the four commissioned paintings on Cornwall. This is Penzance including the Jubilee pool (an art deco masterpiece). I am still working on them even though I was hoping to have them finished last week. I can't show it all as I know the couple read this blog so just a sneaky peak I'm afraid. Crikey! That brings back memories. I did one of my degree design projects based on the Jubilee Pool! I love the colours you've used in your painting. That beautiful turquoise colour is so evocative. 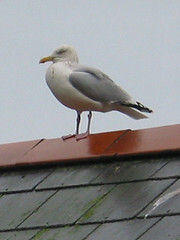 The seagull is very cute! I bet they'll love it! Oh thank you Lesley. I hope they do! I had real fun looking through photographs of the Jubilee pool that led me on to a real fascination with lido's in general. I used to live near a really amazing one in Saltdean near Brighton. I truly love 1930's architecture! oh i thought id written a comment here...i wanted to say that another lovely painting and you have got the tourquoise of the pool just right!!! Does ths place have anything to do with a famous staircase?